Simple fleece baby blanket with white whip stitch trim is a simple yet fabulous new baby gift. Moms on the go will love the lightweight fleece blanket that covers baby, yet isn't a huge crib blanket. 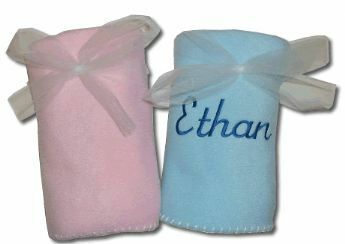 Embroidered with name or initials and offered with optional birth weight and date - this personalized fleece blanket is a great travel blanket for baby.